Artist's conception of NuSTAR in orbit. A NASA orbiting telescope able to view the cosmos through the lens of hard X-rays has launched, and several members of the Kavli Institute for Particle Astrophysics and Cosmology, a joint SLAC-Stanford effort, are eager to take in the sights. NASA's newest telescope headed for orbit Wednesday, developed with help from researchers from SLAC National Accelerator Laboratory and Stanford's main campus. Its rocket ignited in the night skies south of Kwajalein Atoll after being dropped from the underbelly of a Lockheed L-1011 plane. The Nuclear Spectroscopic Telescope Array (NuSTAR) was developed by a team of scientists and engineers under the leadership of Fiona Harrison from the California Institute of Technology. It will use an innovative system of nested X-ray mirrors to open a new window onto the cosmos: the high-energy X-ray window. This is the same range of X-ray wavelengths used to image broken bones and scan luggage. NuSTAR's mirrors will collect high-energy X-ray photons emitted by cosmic sources, focusing the light into images 10 times sharper and 100 times more sensitive than any previous high-energy X-ray telescope. Several members of the joint SLAC/Stanford Kavli Institute for Particle Astrophysics and Cosmology (KIPAC) are on the NuSTAR science team and are looking forward to their first view through the hard X-ray window. "Every time there is a new instrument with significantly better sensitivity than any previous instrument, significant discoveries are bound to follow," said SLAC astrophysicist Greg Madejski, who is leading the KIPAC contingent. He was also involved in defining the science that NuSTAR would do, even before the telescope was built. "The most important study will involve the cosmic X-ray background – understanding the individual phenomena that contribute to it," Madejski said. Probable contributors that NuSTAR is especially suited to view are the innermost regions of black hole event horizons, where particles being slurped up by black holes are boosted to near-light speeds, like too many race cars jammed onto a too-small track, with cosmic fireworks as the result. 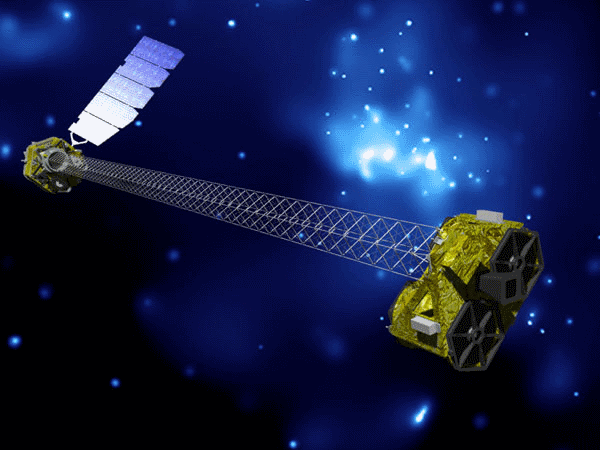 NuSTAR will team with other telescopes to study the high-energy universe. For example, it will use its X-ray eye to examine jets of particles blasting out of active galactic nuclei that already have been pinpointed by the Fermi Gamma-ray Space Telescope. The gamma rays captured by Fermi don't provide enough information to fully explain what powers these jets; according to Madejski, the hope is that NuSTAR will be able to measure the jets' contents and reveal some of the high-energy processes that accelerate the contents to such great speeds. NuSTAR can convert high-energy X-ray photons into sharp images because of its innovative telescope design, said SLAC engineering physicist Jason Koglin, who currently helps users of the Linac Coherent Light Source get the information they need from the LCLS X-rays. Previously, he was at Columbia University working with the team that developed NuSTAR's mirrors. "The whole telescope is basically a set of nested reflective mirrors," which are designed to deflect light onto the special solid-state detector, said Koglin. Each of its two identical optics modules is made of 133 layers of concentric, cone-shaped shells, each shell built of between 12 and 24 individual segments, all molded from ultra-thin glass similar to what's found in laptop screens and glazed with hundreds of layers of reflective coatings. Even with such advanced mirrors, the two optics modules can deflect X-rays only slightly. A week after NuSTAR's launch, a special lightweight gantry will unfurl, providing the 33 feet needed between the modules and the rest of the telescope to ensure that X-rays deflected by the mirrors converge at the right spot. Koglin is waiting along with the KIPAC scientists to see what data the NuSTAR mirrors deliver. "Multi-band studies are so important," he said – in other words, studying the same phenomenon in NuSTAR's hard X-rays and Fermi's gamma rays, or in the less energetic X-rays detected by the Chandra X-ray Telescope. "It's like looking at different colors in a very broad spectrum," he said. "If one of the colors isn't there, you can't even tell you're missing something." With NuSTAR, the cosmic rainbow will be one step closer to complete.